Platforming games have been around for as long as video games have been popular. Everyone remembers his/her first time playing through Super Mario Bros. or Ninja Gaiden and frustratingly dying at the exact same point over and over again. Developed by Illusion Labs, Sway is just such a challenging, fun, and clever platforming game. 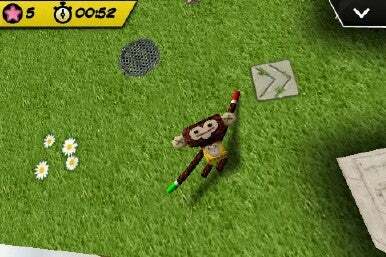 Sway features cute animal characters like Monkee. Instead of ninjas and plumbers, you’re given control over a little cartoon lizard thing named Lizzie. Aww. The comic strip opening screen introduces you to “Sway,” a land where a misguided wizard has unleashed some kind of evil on the world and scattered all of Lizzie’s friends. Lizzie must rescue her friends and save the world. The developers clearly have a sense of humor, depicting their evil wizard mixing his spells and slyly referencing the “Will it Blend?” series of videos from Youtube. The controls for Sway utilize the iPhone’s touchscreen in new ways. The right half of the screen controls your character’s right hand, the left half of your screen controls the left. By tapping the screen, your character will hold onto the wall. By moving your finger, you cause the character to swing. Essentially, the game allows you to swing your character through a variety of obstacles. The tutorial video helps give you an introduction to the game’s unique controls but it will still take you twenty minutes to grow accustomed to the strange motions. Each mission tasks you with guiding Lizzie (or one of her friends) to a goal point. You collect stars or keys on the way and must avoid falling off the map or into some well-placed spikes. Each level is timed and you’re awarded medals depending on how quickly you complete a map and how many stars you collect. The initial levels give you plenty of practice of swiftly jumping from platform to platform, which is great because the later levels are much more daunting. Once they introduce spikes and moving platforms into the mix, the game can go from challenging to cruelly difficult. Like those annoying birds that kill you in the original Ninja Gaiden, you’ll learn to rue the moving spike platforms of Sway. Unfortunately, the only way to save your progress is to hit one of the sparse checkpoints on a map. Otherwise, every death results in you starting back at the beginning of the map. When you’re really close to getting past a row of hairpin jumps, you’ll beg the developers to create an update with a quicksave system. Or, if you like the challenge, this game keeps serving up a loving spoonful of difficulty. This is the only iPhone game I’ve played to date that has made my hands sweat. Every few stages you’ll be confronted with a level where you can collect three keys and unlock another character to play as. After you free the friend, you can control them instead of Lizzie. They range from the long-armed “Monkee” to the fast Ninja Man. All of them resemble Lizzie’s paper-bag-headed cartoony feel but each has its own advantages and flaws. The art style and soundtrack are cartoony but without being memorable. The characters all resemble fashion icons on Paul Frank shirts, and there’s a certain level of amusement had by throwing your character’s cute face into spikes. Sway is ideal for gamers looking for a quick challenge on the iPhone’s mobile platform, and can enjoy a long gaming experience (owing to the difficulty). The replay value is there for players who want to challenge themselves to unlock golds on every course, and typically if you enjoy the kind of maddening difficulty associated with a game like this, you’ll keep coming back for more pain time and time again.